LOUIS FARRAKHAN: The road, you see, represents the black man. The chicken “crossed” the black man in order to trample him and keep him down. MOSES: And God came down from the Heavens, and He said unto the chicken, “Thou shalt cross the road.” And the chicken crossed the road, and there was much rejoicing. 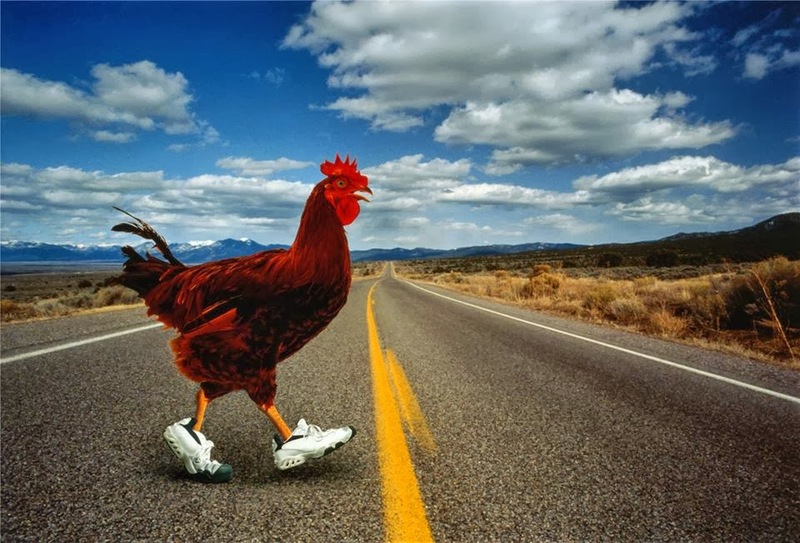 RALPH WALDO EMERSON: The chicken did not cross the road… it transcended it. MICHAEL SCHUMACHER: It was an instinctive maneuver. 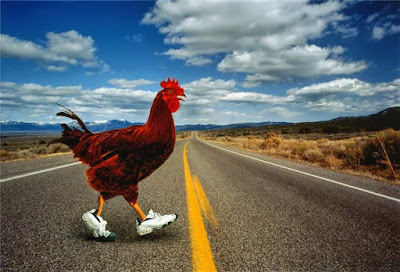 The chicken obviously didn’t see the road until he had already started to cross. ANDERSEN CONSULTING: Deregulation of the chicken’s side of the road was threatening its dominant market position. The chicken was faced with significant challenges to create and develop the competencies required for the newly competitive market. Andersen Consulting, in a partnering relationship with the client, helped the chicken by rethinking its physical distribution strategy and implementation processes. Using the Poultry Integration Model (PIM), Andersen helped the chicken use its skills, methodologies, knowledge, capital and experiences to align the chicken’s people, processes and technology in support of its overall strategy within a Program Management framework. Andersen Consulting convened a diverse cross-spectrum of road analysts and best chickens along with Anderson consultants with deep skills in the transportation industry to engage in a two-day itinerary of meetings in order to leverage their personal knowledge capital, both tacit and explicit, and to enable them to synergize with each other in order to achieve the implicit goals of delivering and successfully architecting and implementing an enterprise-wide value framework across the continuum of poultry cross-median processes. The meeting was held in a park-like setting, enabling and creating an impactful environment which was strategically based, industry-focused, and built upon a consistent, clear, and unified market message and aligned with the chicken’s mission, vision, and core values. This was conducive towards the creation of a total business integration solution. Andersen Consulting helped the chicken change to become more successful.